2019 is the Year of Initiation and Soul Embodiment, and as Initiates of Light, we hear the invitation of the heart’s calling along the Path of Christos-Sophia, the path of Unity and Divine Love through the embrace of the Divine Feminine and the Divine Masculine archetypes. As Flames of Divinity we deepen into the Flame of Divine Love through not only Self-Love and Love for our brothers and sisters but we draw too upon the teachings of ascended realms through the Sisterhood of the Rose and the Brotherhood of the Light. Through all Golden Ages, as the sons and daughters of God, we have anchored the Christos-Sophia Light codes, ignited the three-fold Flame of Power, Love and Wisdom within our loving hearts and within the hearts all awakening and awakened Souls. Revering the goddess, we came together as One Heart and One Unified Field of Light. The Sisterhood of the Rose was initially created in the Golden Age of of Lemuria, and later as Priestesses in Atlantis they gathered together in circles of twelve to activate the three-fold Flame through the hearts of all humanity. There were twelve groups of twelve women who formed the Sisterhood of the Rose. In essence, they held the secrets to the path of ascension through the Overlighting of the Spiritual Brotherhood, representing all 144 Soul ray aspects of the Beloved I Am Presence, which takes us through our spiritual and the physical ascension process as we embody all 12 Higher Selves, and all 12 Soul Rays of each Higher Self. We can further think of this as our multidimensional selves, in particular, the archetypes of Christ Consciousness; the Priests and Priestesses, Healers, Oracles, Wise Women, Diviners, Goddesses, Counsellors, Medicine Women, Shamans, Wayshowers, Grid Keepers, Midwifes, Doula’s, Gate Keepers and so on. When the Sons of Belial, artificial grids and other negative influences disrupted the path of Ascension and One Unity Consciousness in the Atlantean timelines, and the sinking of Atlantis was imminent, the energy of the three-fold flame was withdrawn into the newly formed underground cities of Light by the Sisterhood of the Rose. In order to preserve the Christos-Sophia teachings and anchor the Grail codes or Rose codes, the Sisterhood knew they would go through eons of duality consciousness and with the Brotherhood of the Light, protectors of the Divine Feminine and portrayers of the Divine Masculine, held within their hearts the three-fold Flame until the moment that our brothers and sisters awoke, and were ready once more to embody Soul consciousness and Monadic consciousness; and in each Golden Age the three-fold Flame was anchored and activated, and in this Golden Age, that time is Now. As Sisters and Brothers of the Light, we have gone to hell and back in dissolving lower karmic timelines and embracing all that arises to know ourselves as Love and to shift the karma of humanity. This was a much needed part of our journey to understand the full range of human emotions which led to the suppression of the Divine Feminine and the suppression of the Divine Masculine, created the “war of the sexes” and dimmed the Light of the goddess. Through many ages, we have seen the persecution of women, notably at its peak in the middle ages, where women as healers and oracles and seers, were burnt at the stake, beheaded, raped and mutilated. The Brotherhood of the Light, also known as the Brotherhood of the Rose, we always there too, protecting the sisters. In that timeline, they were known as the Knight’s Templar’s and were often too persecuted and killed for protecting the Sisters of the Rose. These timelines were important to bring us to this point, this moment in time, where we take a deep breath of Divine Love now, breathing in Love and breathing our Love, and just feel the nurturing of the Divine Mother, as well as the acceleration of Soul embodiment through the higher timelines of Divine Love. We are safe now, feeling and experiencing the three-fold Flame within our loving hearts. We have further been experiencing many of our initiations of Light on the inner planes through the ray ashrams of Shamballa and now, come into the conscious remembrance of our initiations of Light, as the Goddess and God energy returns to this sacred earth, and as we gather once more as the Priests and Priestesses, merging with timelines of ancient Egypt, Atlantis and Lemuria and drawing upon our connection to the ascended realms, in new ways; with new teachings, ray colors, and energies we travel in Soul consciousness to the Temples of Light of the Sisterhood and to the Ashrams of Light of the Brotherhood. This is both a Re-Union of Hearts, of our inner alchemical marriage as much as it is the “Divine Union” of the Christos-Sophia codes anchored at zero point through Jesus the Christ and Mary Magdalene, as we find our way through the Flame of the Divine Feminine into the Temples of Light of the Divine Mother and the Divine Father, and receive at this time, Initiation of the Golden Rose. For the goddess symbol is the rose and this is often the first symbol we experience in our initiations of the roses. It is Mother Mary who steps forwards as the embodiment of the Divine Mother. Known as the Divine Mother of Mercy, Healing, Peace, Guidance, Grace, Love, and Protection she nurtures us by giving us the sense of the Mother energy, which many have felt starved off in this Life time, no matter the relationship with our own maternal figures. Mother Mary is of the Angelic lineage and consort to Archangel Raphael working with the ray energies within Shamballa. Mary is also known as the Queen of Angels, and a powerful archetype of the Divine Feminine, of carrying the inner Goddess power and being able to master love for self, as well as mastering nurturing, giving, and mentoring of others. In the Initiation of the Golden Rose Mother Mary invites us into her Temple of the Immaculate Heart, where she embodies and holds the energy of the three-fold Flame of Power, Love and Wisdom. As we journey into our own goddess nature, deeper into Self-Love and Self-Nurturing, Mother Mary takes us on a journey into our loving hearts, and into the embrace of our inner family and inner child, as we allow the tears to flow and our heart to open more deeply in the Love of the Divine Mother, while honoring all that we have experienced to know ourselves as Love. As the silent witnesses, the Beloved I Am Presence, we take the three-fold Flame, and the colored Plumes of Pink, the Flame of Divine Love, Gold, of Unity Consciousness and Diamond, of the energy of Purity and Innocence and our Beloved I Am Presence across the lower timelines, dissolving them in this Now, as we weep our tears of sadness and healing and Love. We are then invited into Shamballa, and more particularly, into the embrace of Lord Gautama Buddha, the Planetary Logos through the second ray ashram of Love-Wisdom. Elizabeth Claire Prophet describes Shamballa as being located in the etheric realm over the Gobi Desert in China. This retreat, once physical, has since been withdrawn to the etheric octave, or heaven-world. “The retreat was originally built for Sanat Kumara, hierarch of Venus, who long ago came to earth in her darkest hour, when all light had gone out in her evolutions and there was not a single individual on the planet who gave adoration to the God Presence or the Inner Buddha. Sanat Kumara was accompanied on this mission by a band of one hundred and forty-four thousand Souls of Light, who, with him, had volunteered to keep the Flame of life on behalf of earth’s people. This they vowed to do until the children of God, who had been turned away from their first Love by fallen angels, would respond to the Lve of God and turn once again to serve their mighty I AM Presence. Four hundred who formed the avant-garde went before Sanat Kumara to build, on the White Island in the brilliant-blue Gobi Sea (where the Gobi Desert now is), the magnificent retreat that was to become for all time the legendary Shamballa. This city was originally a physical replica of the Venusian city of the Kumaras. The volunteers from Venus focused here the one hundred forty-four virtues of the flames of the elements, composing a diamond replica of the focus in the Great Hub. The “City of White” was approached from the mainland by a beautiful marble bridge. The main temple of Shamballa is marked by a golden dome and is surrounded by terraces, flame fountains and at that time seven temples, which now are 12 temples – one for each of the ray ashrams—situated on a wide avenue resembling the Champs-Elysées, lined with trees and flowers, flame fountains and tropical birds including bluebirds of happiness. The altar of the three-fold Flame is in the main temple, where the star of Sanat Kumara is hung from the ceiling over the altar. This, the principal focus of the three-fold Flame upon the planet, was established by Sanat Kumara when he came long ago. Through it, he connected a ray from his heart to every life stream evolving on the planet, and thus assisted their Holy Christ Selves to raise mankind’s consciousness back to the place where they could be taught the laws of self-mastery ignited at this time. The kingdom of Shamballa plays a central role in Tibetan Buddhism. Author Edwin Bernbaum writes that the sacred texts of the Tibetans speak of Shamballa as “…a mystical kingdom hidden behind snow peaks somewhere north of Tibet. There a line of enlightened kings is supposed to be guarding the most secret teachings of Buddhism for a time when all truth in the world outside is lost in war and the lust for power and wealth. Then, according to prophecy, a future King of Shamballa will come out with a great army to destroy the forces of evil and bring in a Golden Age. Under his enlightened rule, the world will become, at last, a place of peace and plenty, filled with the riches of wisdom and compassion”. Gautama Buddha was the first initiate to serve under Sanat Kumara, hence the one chosen to succeed him in the office of Lord of the World. In the mid-fifties it is understood that Sanat Kumara placed his mantle on Lord Gautama, whereupon the chela par excellence of the Great Guru also became the hierarch of Shamballa. Today, Gautama Buddha, Lord Buddha, sustains the tie to the three-fold Flame for all humanity as we experience our first five initiations to embody Soul consciousness and then Monadic consciousness through our sixth and seventh initiations and then many beyond this as we experience the higher ray ashrams too and as we further experience the Plasma Crystalline Diamond Light Bodies. Sanat Kumara further returned to Venus and to his twin flame, Lady Master Venus where he continues his service to the Great White Brotherhood and the advanced evolutions of his home star on behalf of planet Earth. Lord Buddha was born approximately 400 BCE in the area now known as Nepal. He was brought up in a palace with all the comforts and luxuries possible. Growing up a young noble prince, it is said his father sought to shield the young prince known as Siddhartha from the pain and suffering of the world. It is said his father had a premonition that Siddhartha would one day renounce the world. One day, Siddhartha resolved to sit under a Bodhi tree until he attained enlightenment. For several days, he sat in meditation seeking Nirvana. He was further tested by various forces which tried to prevent him realising the goal. What Lord Buddha teaches us is compassion and patience, liberation and understanding that all Life is Divinely Equal, it is just the levels of Cosmic Consciousness that differs from individual to individual, and that by embracing our challenges and our suffering as initiations of Light, we experience once more the three-fold Flame of Power, Love and Wisdom. We are invited into Shamballa where we will experience initially the first 12 ray ashrams and the energy of these rays and end with this Initiation of the Golden Rose, choosing to once more ascend in physical form, to remain here through truly coming Home, as we experience our Christed Overself, our 12 Higher Selves and then our Beloved I Am Presence. 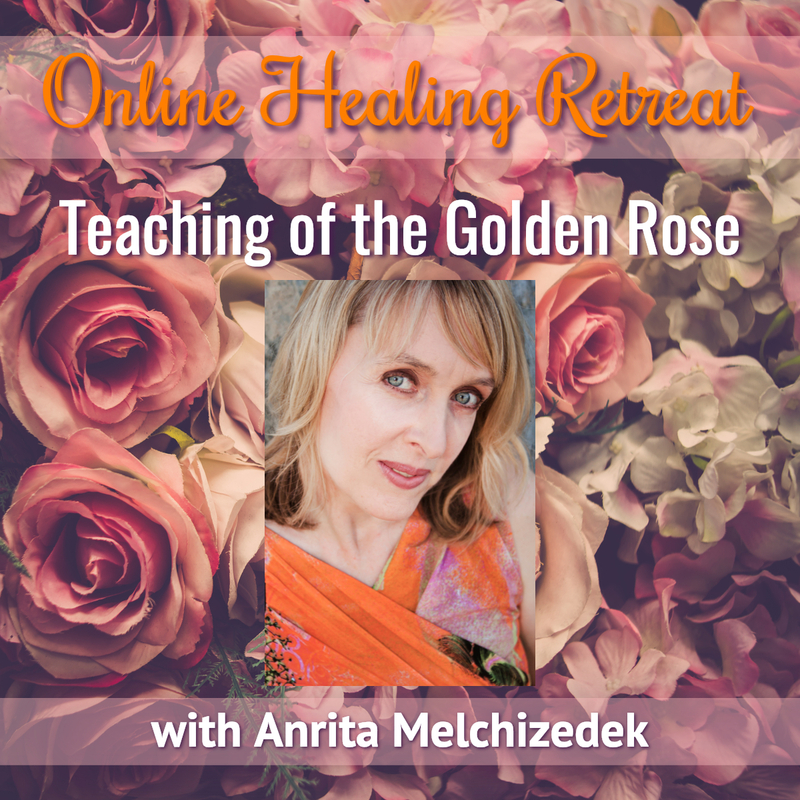 This is an invitation to merge more deeply into the Christed Consciousness of Light that we can experience in this Now, and to remember once more and embody the Teachings of the Golden Rose as we walk the Path of Love, the Path of the Rose. And so it is. And so it is. Come and join us at this amazing moment in time as we experience this wonderful transmission in the form of invocations, affirmations and Light encoded energies.